Home late!!! Trying to catch my breath after carrying two children and an armful of bags up the stairs and into the house. Shoes off, someone's screaming, I'm trying to get settled. Wait a minute. Dinner?!?! This has obviously happened to me more than once, so I've devised a few recipes to have up my sleeve on nights like these in order to feed my super hungry posse in (way) under 20 minutes. I adore pesto, eggs and bread. They have long shelf lives and are always on hand in my fridge. 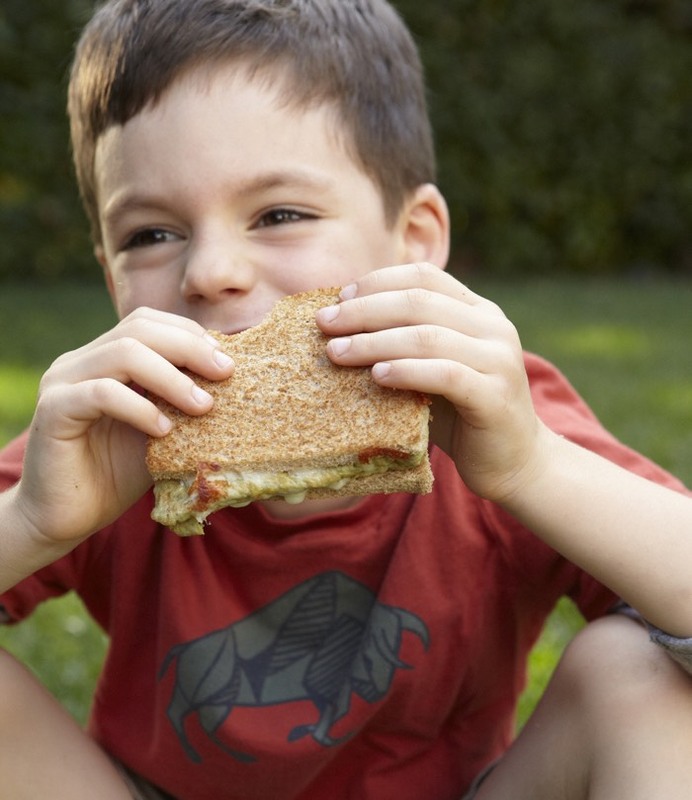 Thank goodness I can use them to make something my guys not only like -- but really love, like this Egg Pesto Melt -- so I don't have the mommy guilt of not getting a decent meal on the table. Even when I'm short on time and still have a night of bath, brushing teeth, books, and bed ahead of me (phew, I'm exhausted...do these days ever end? ), at least I can be assured we all have bellies full of nutritious food. 1. Whisk the 1 egg and 1 tablespoon pesto in a bowl. 2. Heat 1/2 teaspoon oil in a small sauté pan over medium heat. Pour in the egg mixture, tilting the pan to spread it evenly across the bottom. 3. Allow the egg to cook for one minute, using a rubber spatula to gently pull the egg away from the sides of the pan so the rest of the liquid egg can continue to coat the pan and cook. 4. Using the spatula, fold the outside parts of the omelet inwards into a square shape (to fit the bread). 4. Remove the square-shaped omelet to a plate, place a slice of bread topped with 2 tablespoons of the shredded cheese, cheese side up, in the pan. Top with the omelette, another 2 tablespoons of cheese and slice of bread. Cook for 1 minute on each side until golden. I made these this weekend after watching your program - so delicious!! Definitely adding it to my rotation, thank you! This is such a great idea! There are so many ways we could switch them up, too. I didn't have any pesto, but salsa and cheddar cheese worked well as toppings. Thanks! What do you tell the kids it is to get them to eat it? 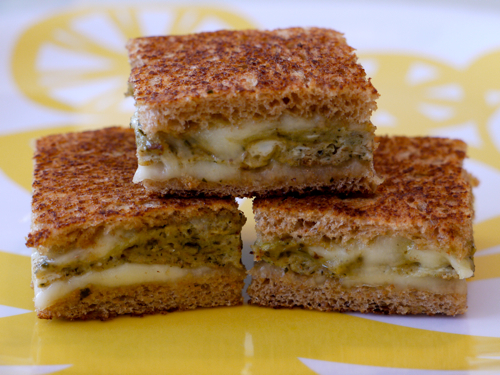 I have a feeling that mine are going to look at me like I'm nuts if I say \"Egg Pesto Melt\". I don't know about your kids, but I find that when I give my kids a 'complicated answer' (Anything that they don't quite understand), they like to pretend that they DO understand, and they don't end up asking questions! The straight forward approach is usually best! This sounds absolutely delicious! Can't wait to give it a try. Thanks for another great recipe. We haven't tried this one yet but I simply love all of your recipes. Your website has motivated me to expand my food horizons and the choices I make for our four year old son. Ben and I love watching your videos. He always asks me \"When can we go visit our friend Kenya in California\"... very cute. Thanks for the inspiration! Made these for lunch today. They were so good. My little girl gobbled it up. I made these and liked them, but felt like a flavor was missing. I love tomato with pesto, so I split the amount of pesto into half pesto/half tomato paste - amazing!!! Yet another great recipe! You're amazing! Made for Saturday morning breakfast and kids and hubby gave it a thumbs up! Thanks! We made these tonight for dinner. My 4 year old ate one fourth of his after I let him dip it in leftover pizza sauce. Dipping seems to be a hit in our house. My husband and loved them, especially since it was such an easy, fast recipe. We ate ours with dijon mustard on the bread because we like to put mustard on just about anything. We served stewed apples with cinnamon as a side dish. Just made these for my 16 month old for lunch. She ate enough to make me happy about it. :) I thought they were delish! Also, I think next time I'll put cheese on both sides of bread so they both stick nicely together. The side with no cheese just feel right off so we ended up having open faced sandwiches. The rocket and alnmod pesto is on high rotation at our house during summer. Also red capsicum pesto it's delicious as a pasta sauce with a little barbecued chicken tossed through the pasta. We ate these today - I added smashed avocado. So yummy! do these stay ok overnight in the fridge followed by the lunch box and not get chewy? I dont have time in the mornings to prepare lunches. i always wonder about pre-grilled stuff. this one looks and sounds delicious and I just know my daughter will love it. You can prepare this the night before! Just let it cool completely before storing in the fridge. That will help prevent it getting soggy! Would love a suggestion for an omelet sandwich that uses feta in the egg, or would that taste badly? I also have recipes for Pistachio Pesto, Pumpkin Seed Pesto and Spinach Pesto! I didn't have pesto so I used a Tbsp of bruschetta mix and a little chopped up fresh spinach instead. My son just turned three and this is the FIRST time he has ever been excited about eggs. He loved it! Thank you so much for this recipe. I can't wait to try it with pesto! Yum! I just made this for myself and it's delicious! Thank you for this super simple yet yummy recipe. Holy cow, this is good! You can't go wrong with pesto but I've never tried it in an omelette before. I started coming to this site to get baby food recipes but since everything I've made has been fabulous I started looking for recipes for the rest of the family too. Keep up the good work! I keep wanting to ask: Do these keep well for a school lunch? (And I presume they're then eaten cold??) I'm having trouble picturing my kiddos eating a cold egg sandwich for lunch but couldn't figure out how else this could make a lunch box?